Kindly note i were facing recently a problem with the VoiceGuide service which is setting stopped suddenly and once i enable again its get stopped until i restart the server, then it will work for couple of hours then it will get get stopped, i really need your support urgently since this is really critical and effecting our business. 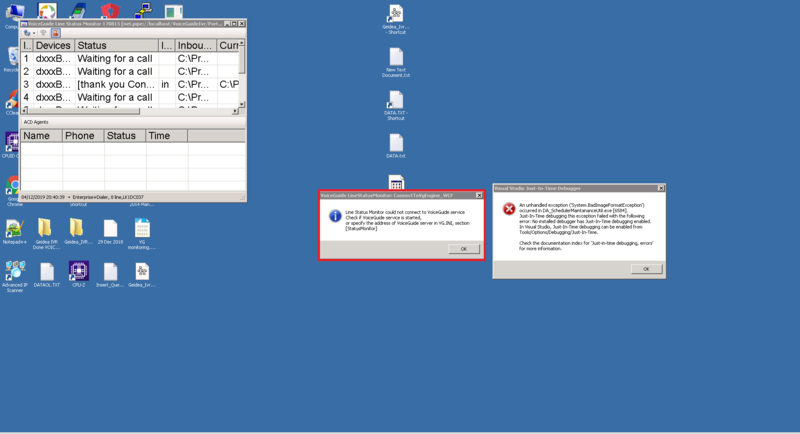 Screenshot shows error in "DA_SchedulerMaintanaceUtil.exe"
"DA_SchedulerMaintanaceUtil.exe" is not a VoiceGuide program. Our records show that this system was deployed over a year ago. Would suggest looking at what changes have been made to the system recently, as these would most likely be related to the problems that you are now seeing. Would especially look into the "DA_SchedulerMaintanaceUtil.exe" software. Can you also please .ZIP up and post the VoiceGuide logs from last few days ago (the logs are in VoiceGuide's \log\ subdirectory). Looking at these logs will let us confirm VoiceGuide software operation. That's error message related to other software why its effecting Voice guide windows service i want your support for the error message in the red box please ignore the other one, once i got the error i will post the logs since i have deleted it due to big storage to usage. Please post logs when available. And as advised before: recommend looking into what was changed on this system recently, as whatever changes were made, they are most likely related to issues encountered. Please also save the Windows' Events to the file and post it here. In Save as type , make sure the "Event Files" is set. Post the created .evtx file here.